Love my new blue dial. It’s a great value proposition! A lot of watch for the money. I think it's different, if not inverse, sorry! in my honest opinion, Audi is a lot of money for a car. Sorry again. Personal tastes. When speaking German cars, Audi gives a lot of stuff standard that BMW, Mercedes, Porsche doesn’t. When comparing Swiss watches, Omega gives a lot of features that other brands would make you pay for. That is what I mean by my statement. I agree actually. It's my wife's car but we looked at a lot of cars in this class and Audi definitely delivered the most car for the money (Quattro is standard for example). And frankly Audi's lineage in terms of racing is far greater than the other brands out there, except for maybe Porsche. She drives the Q5 and for a small SUV it's a lot of fun to drive. All of this said, I drive a Ford F150 because I do live in Texas after all. 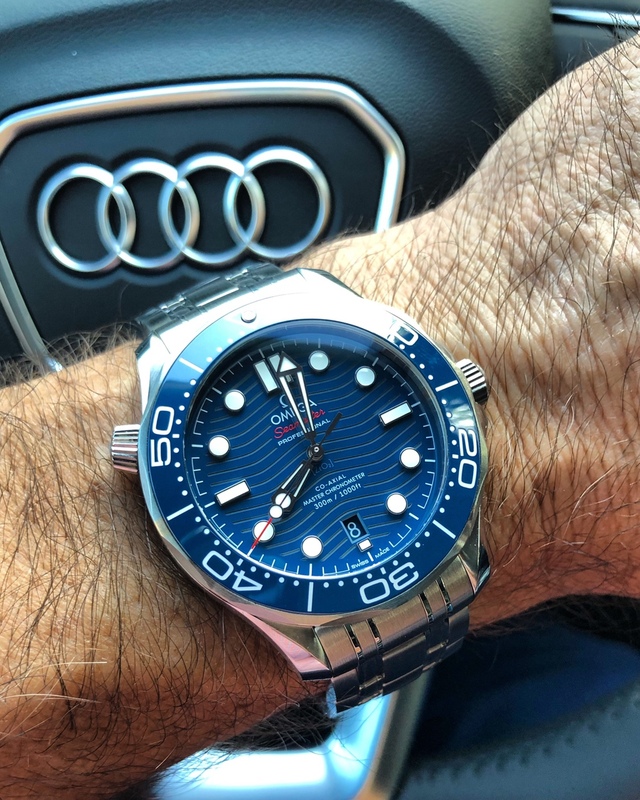 The blue dial 2018 SMPs on bracelet look pretty sharp. I just don't like the non-tapered bracelet look, I'd consider getting this on rubber to go with with Rolex 16610. Omega certainly gave care to the design from all angles. Agreed. It's the most complete SMP design of the modern era. Stanul, tbensous, boatswain and 2 others like this. Apologies if this has been posted previously but man, look at that box! boatswain, BufordTJustice, Jaguarshark and 1 others like this.